The 77-story tower will be right next door to the already growing 80-story Extell tower. LOWER EAST SIDE — The city has rejected a proposal from elected officials that would have required a group of planned waterfront high-rises to go through the city’s extensive, multi-leveled approval process before getting the green light. That would have put the plans through the city’s seven-month Uniform Land Use Review Procedure (ULURP) process, which calls for a review from the local community board, the Borough Board, City Council, and the mayor before an approval is issued. But the department’s director on Thursday rejected the proposal, noting that the developments do not meet the city’s requirement for “major modifications” because they do not require new waivers or zoning actions — but still pledged to take other actions to monitor the development influx. “…Although these proposals will not be reviewed as major modifications, the Department of City Planning is committed to working with you closely as we review the applications for these developments,” said director Carl Weisbrod in a letter dated Aug. 11. The department will subject the developments to the City Environmental Quality Review (CEQR) process, requiring the completion of an Environmental Impact Statement for each development that will assess the towers’s impact on the existing environment, said Weisbrod. The review process will provide the opportunity for public comment and hearings, and will examine the buildings' impact on light and air in the neighborhood, as well as other impacts related to increase density — concerns previously highlighted by locals living in the shadow of the developments. Elected officials and community members are concerned about three large-scale developments expected to slam the Two Bridges waterfront in addition to the already-growing 80-story One Manhattan Square from the Extell Development Company. 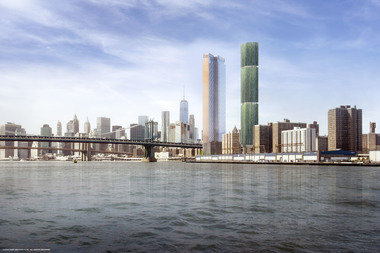 A 77-story residence from JDS Development is planned for a plot of land right next to the Extell tower, though DCP has put the development on hold pending the resolution of a couple of lawsuits from the owners of a neighboring property alleging the developer is not entitled to the development rights, as first reported by Crain’s New York. Meanwhile, two other towers may be in the works — Two Bridges Associates, a joint venture of L + M Development and the CIM Group, are “evaluating development options” for a Cherry Street site, according to a rep, while the Starrett Corporation is reportedly looking to develop a waterfront parcel. A neighborhood group representing the interest of Lower East Side locals said the environmental review process is not enough given the scale of the projects, citing community concerns about the area’s “rapid-fire development” with no promise of a certain amount of below-market-rate units. “Although we are optimistic about the requirement of an Environmental Impact Statement, proposals of this scale should warrant the rigor and review of full ULURP ensuring proper neighborhood planning,” said Trever Holland of Tenants Fighting of the Lower East Side. Councilwoman Margaret Chin, who led the charge among several other elected officials in pitching the ULURP proposal, also expressed disappointment at the city’s response but optimism at working with DCP to monitor the plans moving forward. “We are disappointed by the decision not to treat this as a major modification to the Large Scale plan, but are encouraged by the requirement of an Environmental Impact Statement that will address the cumulative impact of these planned developments in the Two Bridges neighborhood,” said spokesman Paul Leonard.